William of Ockham (or William of Occam) (c. 1285 - 1348) was an English Franciscan friar, philosopher and theologian of the Medieval period. Along with St. Thomas Aquinas, John Duns Scotus and Averroës, he is one of the major figures of late medieval Scholastic thought, and was at the center of the major intellectual and political controversies of the 14th Century. He is sometimes called the father of Nominalism, strongly believing that universals are merely mental concepts and abstractions which do not really exist, except in the mind. In addition to formulating his famous methodological principle commonly known as Occam's Razor, he produced significant works on Logic, physics and theology. His philosophy was radical in his day and continues to provide insight into current philosophical debates. In 1320, he completed study for his bachelor's degree, and he lectured on Logic and natural philosophy in a Franciscan school from 1321 to 1324, while he waited to return to university to study for his doctorate (although events were to overtake him and he never completed his master's degree or doctorate). During these years he wrote many deep works on philosophy and Logic, including his monumental three-part "Summa logicae" in which he lays out the fundamentals of his Logic and its accompanying Metaphysics. In 1324, he was summoned to the Papal court at Avignon, France, under charges of heresy (possibly levied by the Oxford Chancellor John Lutterell), and a theological commission was asked to review his "Commentary on the Sentences" (a commentary he wrote on the "Book of Sentences" of the 12th Century Italian theologian Peter Lombard, a standard requirement for medieval theology students). Lutterell made a list of 56 statements (later reduced to 49) which he deemed to be erroneous or heretical, but in fact Ockham's views were fairly conservative and his religious statements mostly had adherents among the leading Franciscans, so he was not formally condemned for his teachings. However, while undergoing these disciplinary difficulties, under a loose form of house arrest, Ockham also became involved in another debate, when he was asked to review the arguments surrounding "apostolic poverty" (the belief that Jesus and his apostles owned no personal property and survived by begging and accepting the gifts of others). This was the subject of another charge of heresy by Pope John XXII (who opposed the belief) against the Franciscan Minister General Michael of Cesena in 1327. Having weighed the evidence, Ockham sided with the Minister General, which brought them both into conflict with the Pope, whom Ockham effectively accused of heresy himself. He spent much of the remainder of his life writing on political issues, especially on the relations between Church and State (notably his "Dialogue on the Power of the Emperor and the Pope"), and he continued to attack papal power, always employing logical reasoning in his arguments. After Michael of Cesena's death in 1342, he became the leader of the small band of Franciscan dissidents living in exile with Louis IV. 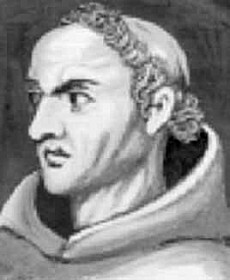 The French Franciscan philosopher Peter John Olivi (1248 - 1298), an extremely original thinker and pioneer of many of the same views that Ockham defended later in his career, was clearly an important influence on Ockham, although he never acknowledged it (possibly because Olivi himself was condemned as a heretic). Ockham has often been cast as the outstanding opponent of Thomism and St. Thomas Aquinas, the great Medieval "synthesizer” of faith and reason, although in reality he did not criticize Aquinas any more than he did others. One important contribution Ockham made to modern science and modern intellectual culture was his principle of ontological parsimony in explanation and theory building, which has become better known as "Occam's Razor" (or, less commonly, "Ockham's Razor"). Essentially, the principle states that one should not multiply entities beyond the necessary ("Entia non sunt multiplicanda sine necessitate"). Or, alternatively, one should always opt for an explanation in terms of the fewest possible number of causes, factors or variables. Or, again, one should always take a bias towards simplicity when constructing a theory, and not construct unnecessary and over-elaborate explanations. In Ethics, he was a supporter of Divine Command Theory, a deontological and absolutist approach to Ethics which believes that an action is right if God has decreed that it is right, and that an act is obligatory if and only if (and because) it is commanded by God. Thus, in answer to Plato's question: "Is something good because God wills it, or does God will something because it is good? ", Ockham (against the majority view) resoundingly asserts the former. In his view, God does not conform to an independently existing standard of goodness; rather, God himself is the standard of goodness. He contributed to an important development in late medieval Epistemology with his rejection of the Scholastic theory of species (which he held was unnecessary and not supported by experience), in favor of a theory of abstraction. He also distinguished between "intuitive cognition" (which depends on the existence or non existence of the object) and "abstract cognition" (which "abstracts" the object from the existence predicate). In effect, he defended direct realist Empiricism, according to which human beings perceive objects through intuitive cognition, without the help of any innate ideas. In Logic, he came very close to stating what would later be called De Morgan's Laws (expressing pairs of dual logical operators in terms of negation), and also considered the concept of ternary logic (a logical system with three truth values: true, false and some third value), a concept that would only be taken up again in the mathematical logic of the 19th and 20th Centuries. Ockham also wrote a great deal on natural philosophy, including a long commentary on Aristotle's physics. One important view he held, contrary to the contemporary theory, was that motion is essentially self-conserving in itself, without need of any causal force (an application of his "razor" or the principle of parsimony).